My dad was out of town for his birthday, so I couldn’t send something to arrive that day. I am pretending it threw a wrench in my plans, but really, the gift I decided to make for him wasn’t finished until the day of his birthday, anyway. At least I called him! I sew and draw and do right-brained things. My dad is an engineer. Growing up, I didn’t always see what we had in common. When I finished law school and was studying for the bar exam, I saw a job posting for an in-house attorney at a machine tool company. Naturally, I called my dad to see if he knew anything about the company. He did. I worked at that company for the next five years, until I moved from Chicago to D.C. I will always be grateful to that job for bringing me a little closer into my dad’s world. He still sells tooling for machine tools, and my company sold machine tools. He could tell me things about our competition, and I would call to tease him when his competition bought breakfast for our office. I also understood more about the products that made up his work days and were responsible for his problem solving. This was his first birthday where we are no longer working in the same industry, so I wanted to make something that was a little nod to both our differences and commonalities over the past few years. 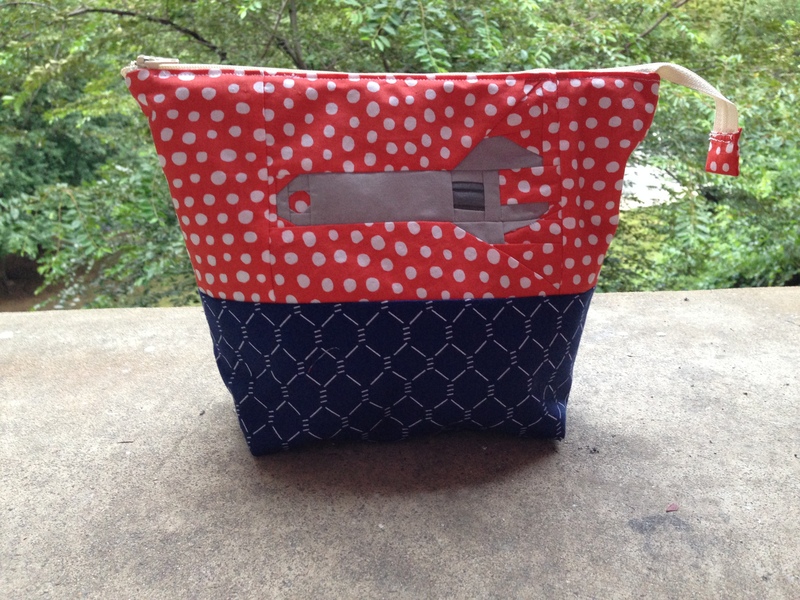 Presenting… the wrench pouch! I figure he can use it to organize his suitcase since he travels for work most weeks. The wrench is a nod to our tooling/machining shared interest. And it’s sewn because he gave me the opportunity to follow my own path. 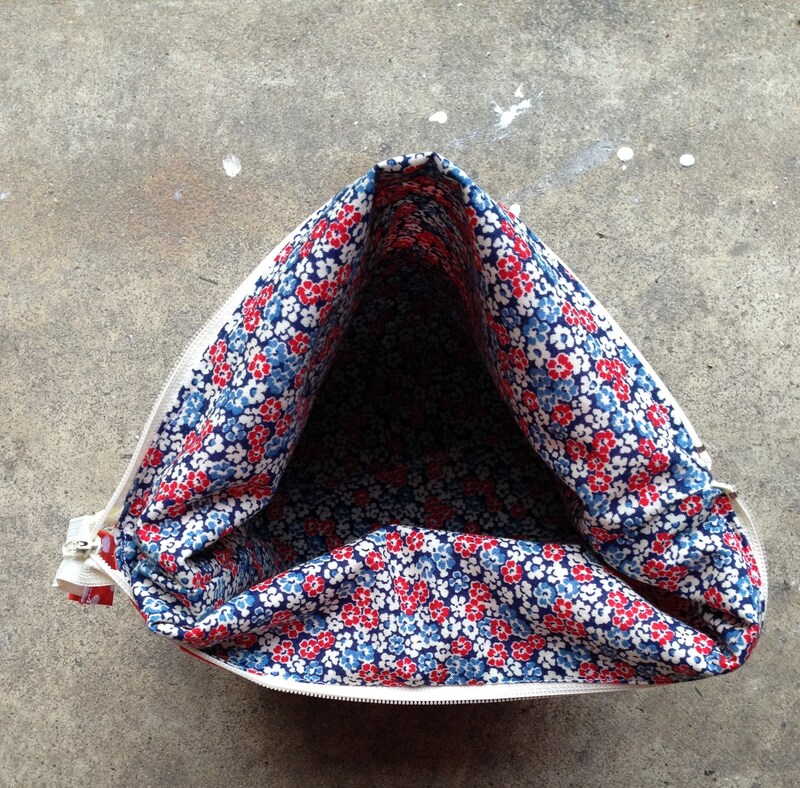 Project details: I used the Open Wide Zippered Pouch DIY Tutorial (free) by Noodlehead. I made a hybrid size: the 12″ width of the medium bag, but 11″ tall instead of 9″. I wanted more of a square shape. I made the wrench paper piecing pattern myself in Microsoft Publisher. Then I ignored my own numbering scheme and had to re-sew the back end of the wrench. Twice. Categories: Other Sewing | Tags: birthday, birthday gift, blue, dad, fourth of july, free pouch tutorial, gift, job, machine tool, machine tools, noodlehead, open wide zippered pouch, paper piecing, patriotic, patriotism, purse, red, red white and blue, sew, sewing, sewing machine, suitcase, tool, tooling, travel, travel back, traveling salesman, white, work, wrench paper piecing pattern, wrench paper piecing quilt block, wrench pattern, wrench quilt block, zipper, zippered bag | Permalink.